This is not like any other nutrition program you know! Ever walked into a grocery store or restaurant not knowing what choices to make to help you look and feel great? There is truth to the old adage, “You are what you eat”! The problem is most of us don’t know how to make those healthy choices that could transform our lives. Our nutrition program is here to help you do just that. Created by, Nicole Marchand (MS, RD, LD/N, a Registered Dietician), our nutrition coaching program has proven to be successful again and again. Thousands of people across the country are using this program to achieve their fitness goals and enhance their sports performance. We will arm you with the knowledge you need to make powerful nutrition choices that can radically change your life. This is a simple, science-based approach to nutrition and wellness that can help renew your energy and stamina, build muscle mass, look and feel better than ever before. Most diet plans will tell you what you should NOT eat. The Internet is filled with all kind of diet plans, and even supplements that can replace meals. Maybe you’ve even tried some of them. The problem with these diet techniques is that they are temporary and you quickly regain the weight you have lost. Our unique nutrition program is designed to build life-long skills that will teach you what you CAN eat. We use behavior modification strategies that work toward a POSITIVE change in your life. This creates a no-stress dieting approach that will reap a lifetime reward of health and fitness beginning with the basics, building up and moving on to on-going coaching. After completing our nutrition counseling program you will never look at food the same way again. That’s because this nutrition program is based on the pyramid approach. 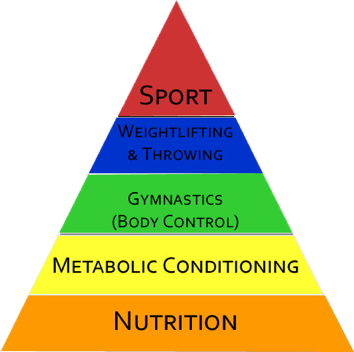 No matter how good your diet plan and workouts are, you will not achieve your goals unless you follow the pyramid. Each step in the pyramid is built on the step before. It begins with the basics which is nutrition. Nutrition is the first component in the pyramid. Everything else you hope to achieve on the higher levels of the pyramid will depend on your body receiving the right nutrition. The basic components of food such as protein, carbohydrates, fats and micronutrients are needed in proportion to individual needs. Nutrition timing is equally crucial to health and wellness. Metabolic conditioning is the next step in the pyramid. Our professional coaches will help you maximize your workout for intense calorie burn during and post exercise. But remember your achievement here will depend on your nutritional intake. Gymnastics is a weight-bearing exercise that helps support healthy bones and muscles. The coordination, control and flexibility required in doing gymnastic exercises can help promote discipline and self-esteem. Again you will not achieve maximum benefits unless you build on proper nutrition and optimized metabolic conditioning. Weightlifting and Throwing accelerates strength-building, increases muscle mass quickly and promotes fat loss simultaneously. Sports performance is the ultimate goal achieved by first learning to fuel your body with proper nutrition. You will then journey through different levels in the pyramid resulting in optimal health. If you have a deficiency at any level in the pyramid the components above will suffer. Take the first step towards health and fitness by building life-long skills! You’ll find simple changes in your daily routine can help you achieve your goals faster and maintain fitness for a LIFETIME. This is an introduction to the basics of nutrition and is designed to empower individuals to make the right nutrition choices to produce results that will positively impact their individual health goals. In this 60-minute 1-time consult, you will understand how different components of nutrition and nutrient timing play a role in achieving your desired goals. We will conduct an Biometric body composition scan, provide you with a printed information packet and sample meal plans for one week. This program is designed for individuals who have specific goals in mind but want more accountability in achieving those goals. You get everything in the 4-week plan and in addition, you will get to check in with a nutrition coach every week. During the weekly 15-minute consultation, your progress will be reviewed and progress measured. With any one of the above options you can choose on-going coaching to keep you accountable and on track with your goals. Each monthly 30-minute meeting will include an Biometric body composition scan, assessment and review of your goals and measurements, and modifying your nutritional plan if necessary. Hundreds of people who have finished our nutrition coaching program have experienced more energy. They look and feel better! They’re confident about knowing what to eat and when to eat it. And more importantly, they know exactly what to do even after a cheat day.